Jesus has been called many things by many people. An ancient Hebrew prophet foretold that Jesus would bear the various titles Wonderful, Counselor, Mighty God, Everlasting Father, and Prince of Peace. 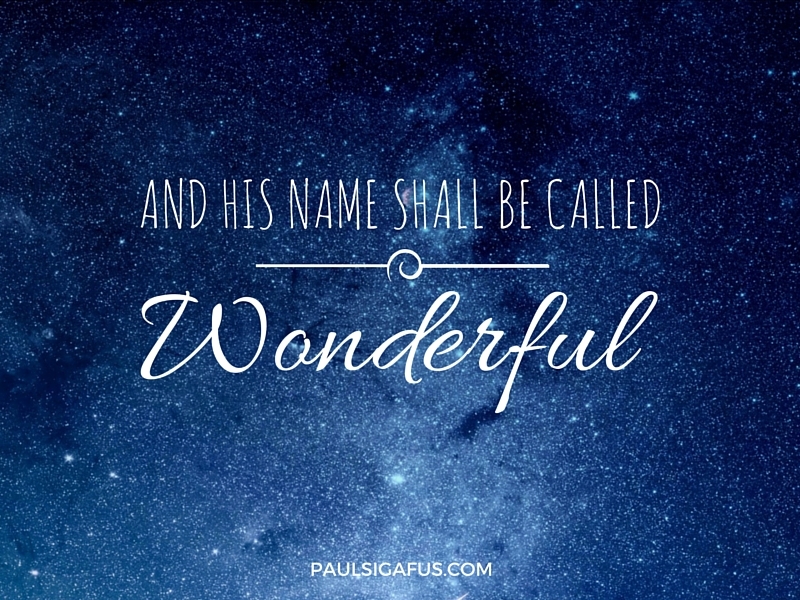 and His name shall be called wonderful. Although the other majestic titles have their place, wonderful doesn’t focus on Jesus’ wisdom (Counselor), power (Mighty God), or nobility (Prince). Wonderful focuses on something made beautiful by its simplicity: the natural feeling of delight and pleasure that you feel when in the presence of a true friend. Why do I call Him wonderful? Inspiring delight, pleasure, or admiration. I feel really thankful for my spiritual journey over the past year. Although some of my struggles and questions remain, I’m learning how to leave my spiritual despair behind as I rediscover that special delight in my friendship with the Divine. Why do I call Him wonderful? Because His friendship teaches me that He doesn’t live in a tiny box—God loves wide-open spaces where He really has room to move. Like in my real-world friendships, I’m learning how to feel God’s presence in His silence, rather than feeling ignored by Him. I’m learning that God’s love for His children (that’s all of us, folks) isn’t regulated by policies or limited by institutions. I’m learning how to experience friendship with God more directly, while continuing to work out my relationship with my church. Borrowing words from a friend of mine, my life of faith is becoming more of a dance and less of a march. Our response to God should not be one of question, but of wonder. My hope is that in the years ahead all of my fears about God will fall away, and that I’ll come to rest, grow, and delight in the presence of a God who loves me without reservation. I imagine that you hope for this too. During this Christmas season, may we all experience more delight in our friendship with the Divine, so that we too will naturally call Him… wonderful. If you have a friend who could use a little boost during the holidays, feel free to share by clicking on the social media button below! I am curious why you refer to God as the Divine? This resonates with me. Where did you learn this? This is such a beautiful message, Paul. Thank you for your expressions of love for our Savior.